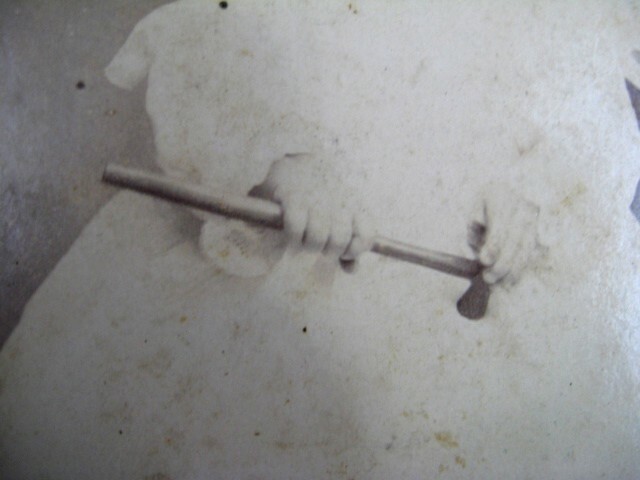 Like any other time of war, children wanted to play with the weapons of their fathers. The fur trade period was no exception. Officers wives and children sometimes accompanied them to their stations at forts. In 1775 a small detachment of troops at Fort Ticonderoga had 46 men and as many as 24 of the soldier's wives & children within the fort walls at one time. (Fort Ticonderoga by Carl R. Crego, 2004 pg. 44). 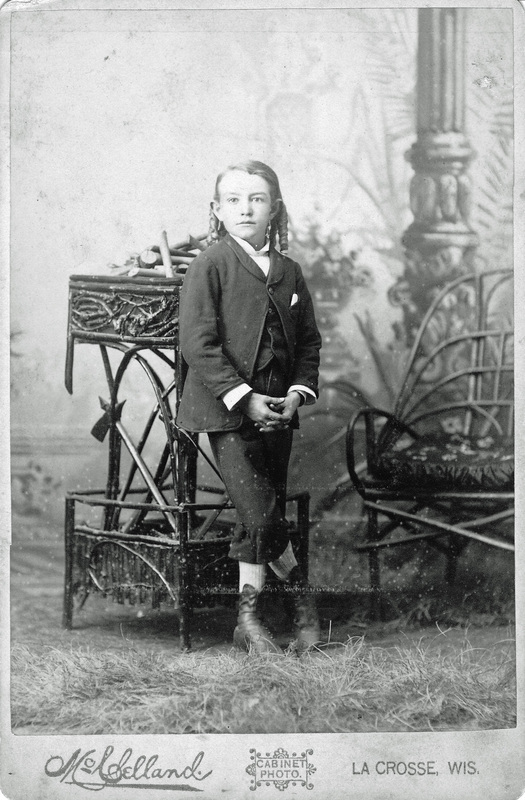 Certainly other children of the frontier had the occasional toy tomahawk to wield at the trees and would explain the oddities of some very old tiny pieces that don't seem to fit any other category. Because of the belt axes small size (see page 8) they can be confused with toy tomahawks too. 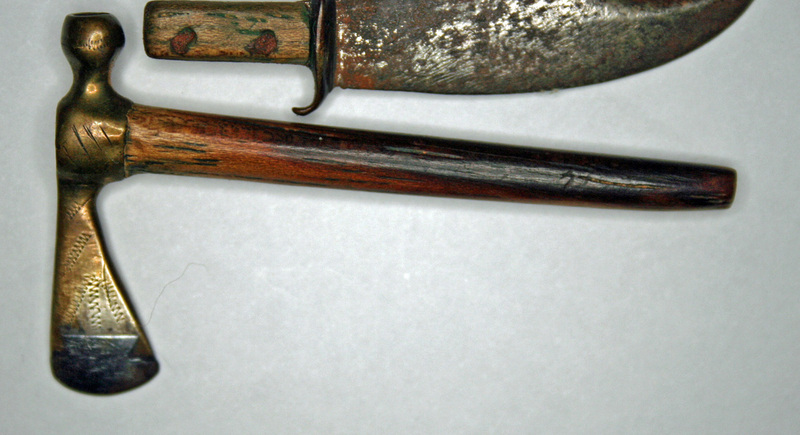 While belt axes are small, they are generally not quite as small as toy tomahawks & certainly not shaped like what we now term as 'trade axes'. Toy trade axes will generally not have laid on steel edges as do belt axes but I have seen one that was. 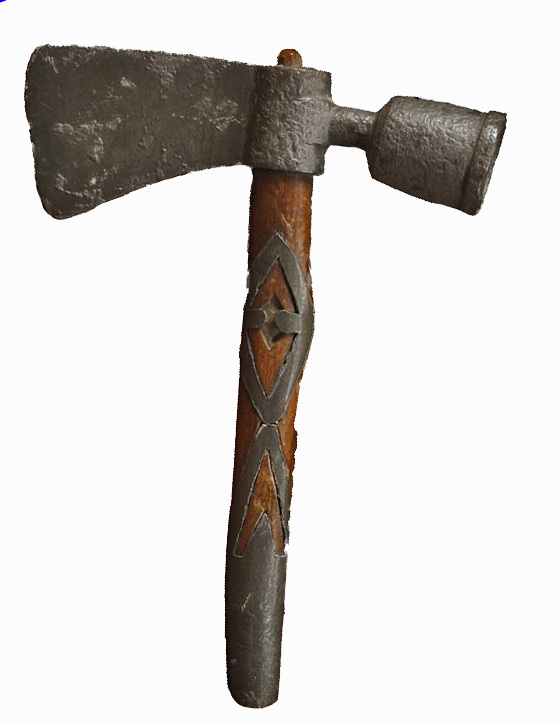 Toy trade axes are often forged like their full size counterparts. Toy spike tomahawks will be significantly less than 5" in head length. No documented full-size spike tomahawk of less than 5" has ever been discovered to my knowledge. 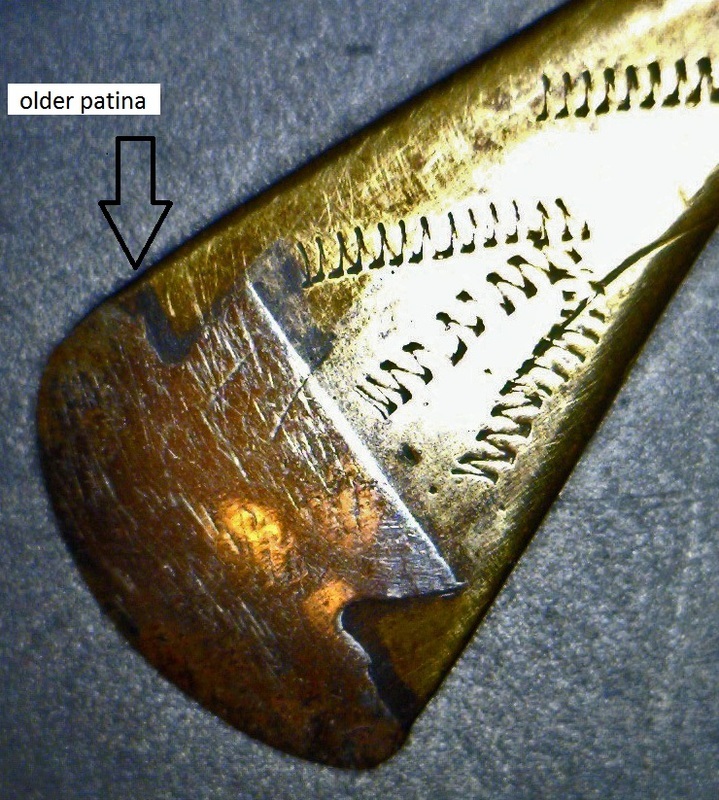 There are no definitive tests to determine whether a particular axe was used as a toy or not, other than comparing to other known dated examples. 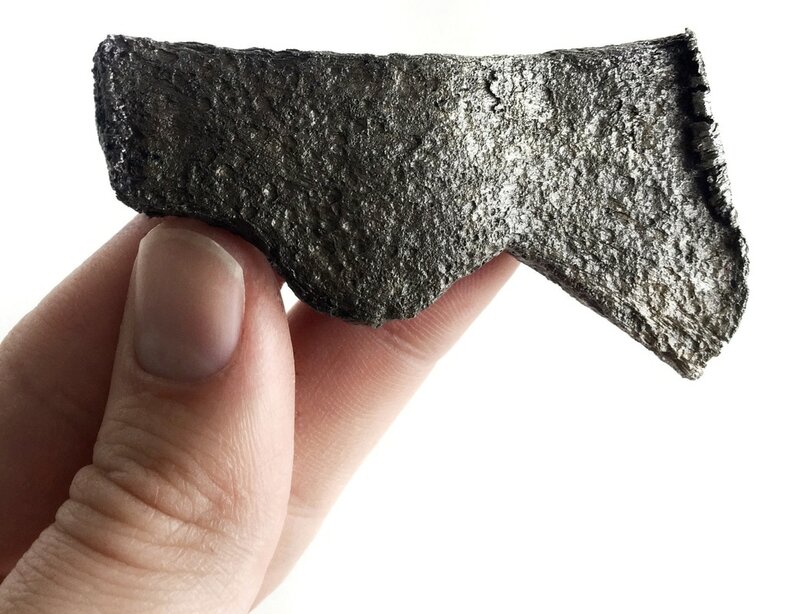 This wrought iron axe is made in the typical Hudson's Bay Company trade axe style, but is miniature in size. It is an exact duplicate of the larger single piece, round headed axes made in the Blacksmith Shop at Fort Vancouver. It was found during archaeological excavations, and is associated with a burnt refuse pit feature outside the southeast corner of the fort site. 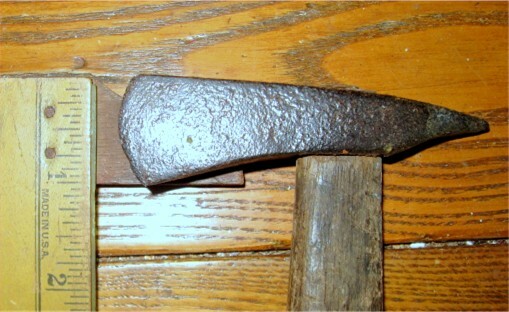 A full-size trade axe has been included in the image for comparison. 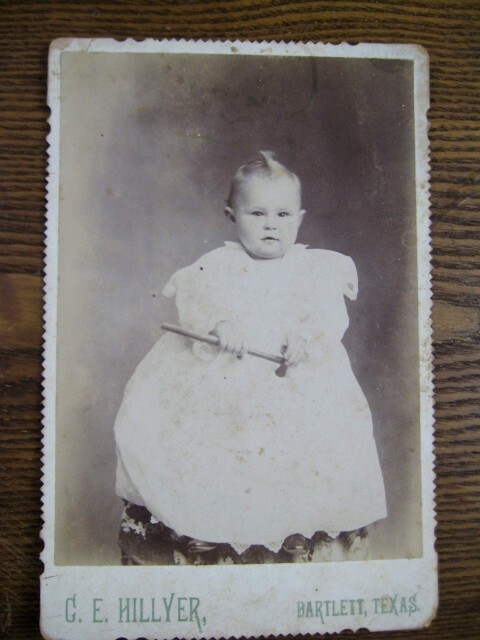 L 2 5/16", W 1 1/8", D 9/16"
CDV 1850's-1880 of child holding toy spike tomahawk. 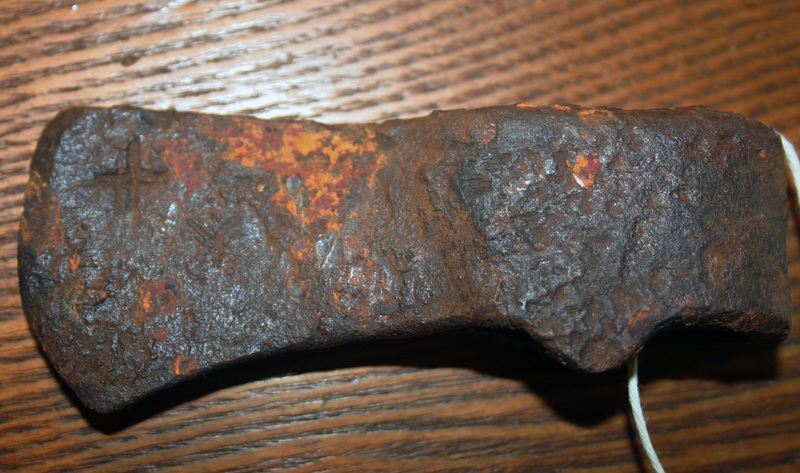 This hand forged spike axe is 9 3/8" overall length with a head that is a mere 3 3/4" long x 1" wide x 5/8" thick. It weighs a total of 4.5 ounces with the haft. The oak handle is old but probably not original. There is no laid-on steel on the blade. This circa late 19th C. toy axe was formed in the traditional wrap around method, weighs 4.5 ounces, 3 7/8" long x 1.5" wide x 3/4" thick. 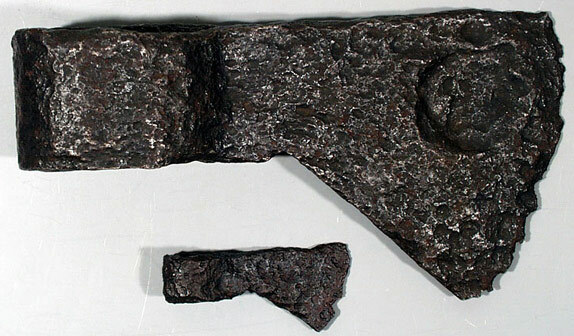 Wrought iron with no laid-on steel on the cutting edge indicates it was not likely used as a belt axe. The crude cross like markings on this one tends to mimic marks found on full size ones. 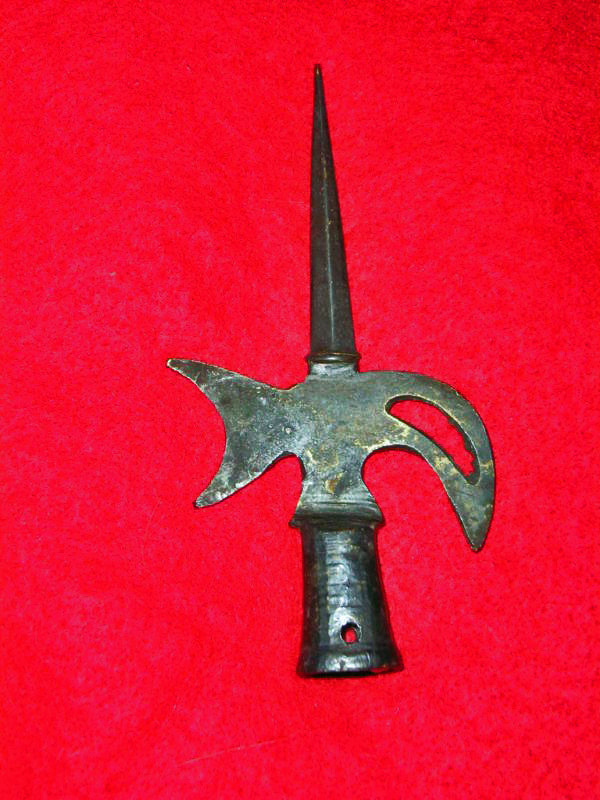 I've heard a few collectors claim these miniature tomahawks had extra long whip-like hafts used by warriors --despite any evidence to support that belief. Confirmation bias is born out of desperation. This toy with a cast iron head was probably made in the early 20th C.
Tiny toy or miniature pewter pipe tomahawk an incredible 3.625" long total! Possibly Indian made it was designed to be smoked. Its hard to tell if this halberd style tomahawk next to the child is a toy or a prop. Probably just a phony prop but I thought it was interesting none the less. This tiny socketed halberd head is displayed in the Old Salem Massachusetts Toy Museum. 3.5" X 2". I couldn't help but add this one although its in no endanger of being mixed up with originals. It is a tiny 2" total in length & probably made for an Indian doll or frontiersman. In any case it has some age to it & made nearly identical to the original. The bone haft is fully drilled as is the pipe bowl. The brass head was cast & has a steel dovetailed edge just as originals. It even has rocker engraving on it as originals had. Whoever made it knew exactly what the originals looked like. I wish people would stop shining these things up.